Attorney General Roy Cooper now holds a 4.4% lead over Gov. 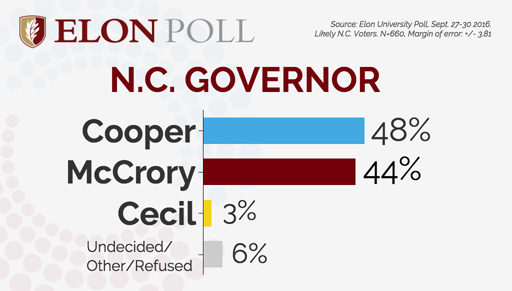 Pat McCrory in North Carolina’s hotly-contested gubernatorial rate, according to to the latest Elon University Poll. McCrory, who enjoyed a three point lead just last month, has seen some of his support erode because of the anti-LGBT law known as HB2. In recent weeks, the NBA, the NCAA, and the ACC have relocated championship games away from North Carolina in protest of the discriminatory legislation. 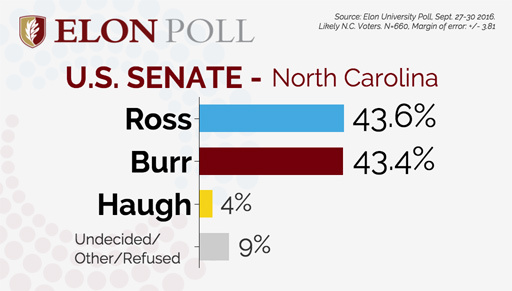 In the U.S. Senate race between incumbent Republican Richard Burr and Democrat challenger Deborah Ross, it’s essentially a tie with Ross holding less than a 1-point lead over Burr — 43.6 percent to 43.4 percent. At the top of the ticket, Hillary Clinton holds the lead with 44.5 percent of voters, compared to 39 percent of respondents who plan to vote for Trump. Libertarian Gary Johnson has seen his base of support increase since September to 9 percent.Roughly seven percent remain undecided. It’s also worth noting this poll was done immediately after the first presidential debate on September 26th. 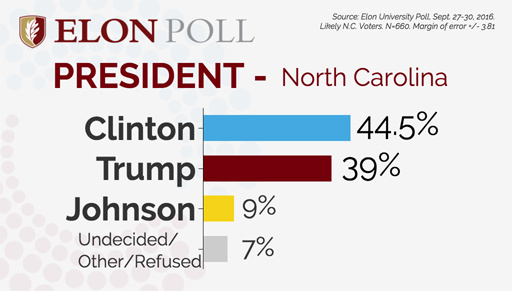 The Elon Poll surveyed 799 registered voters from Sept. 27-30. Of those respondents, 660 said they are likely to vote in the November election. The poll has a margin of error of +/- 3.81 percentage points. You can find the crosstabs here. Please stop, you can not win. give up and stop. you are asking us to vote for trump. why would you do that?you want to help him?